Frankfurt Airport (IATA abbreviation FRA), also called Frankfurt Airport called, is the most important airport in Germany and one of the 10 largest airports in the world. Lufthansa and KLM flies several times daily between Amsterdam Schiphol Airport and Frankfurt Airport. Much is flown by business travelers. As a result, tickets are often not very cheap. 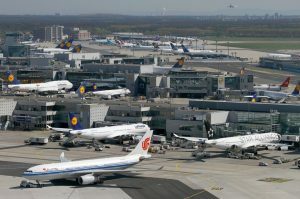 The airport is home to Lufthansa and Munich Airport along with a transfer airport in the network of the airline alliance Star Alliance airlines in Europe. A large proportion of passengers at Frankfurt airport is also a transfer passenger. One of the largest office complexes (The Squaire) lies at the terminals of Frankfurt Airport. Frankfurt Airport consists of two contiguous terminals. To save time you can make the distances with the Skyline, an unmanned shuttle train. The airport is bigger than Schiphol, but has fewer runways (only 4). About 60 million passengers were handled in 2014 at the airport.